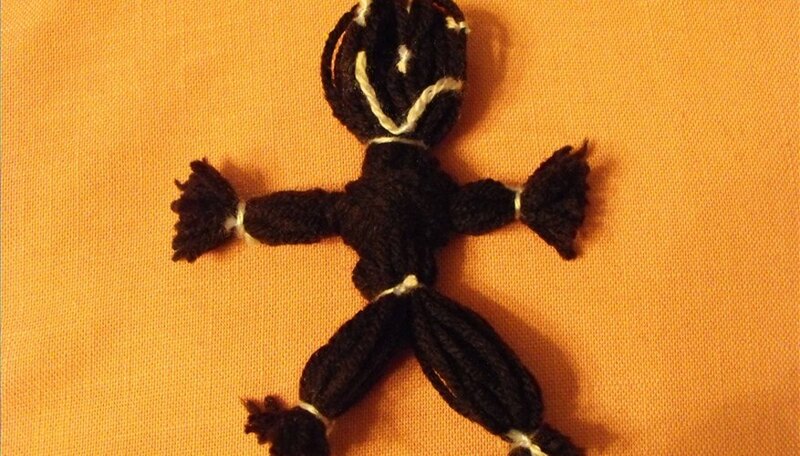 String dolls are a traditional child's toy that is easy to make. Often the activity of crafting the doll brings as much enjoyment as the doll itself. The soft bodies are perfect for hugs and cuddles. Unlike expensive counterparts, string dolls can be dropped on the floor and dragged along on wild adventures with little damage. Pinch the end of the string in your left hand. Pinch the string with your right hand 12 inches from your left hand. Bring the string in your right hand to your left hand and hold it tightly. Continue pinching the string, moving it from your right hand to your left hand in 12-inch segments 50 times. Snip the string so it is no longer connected to the string ball. 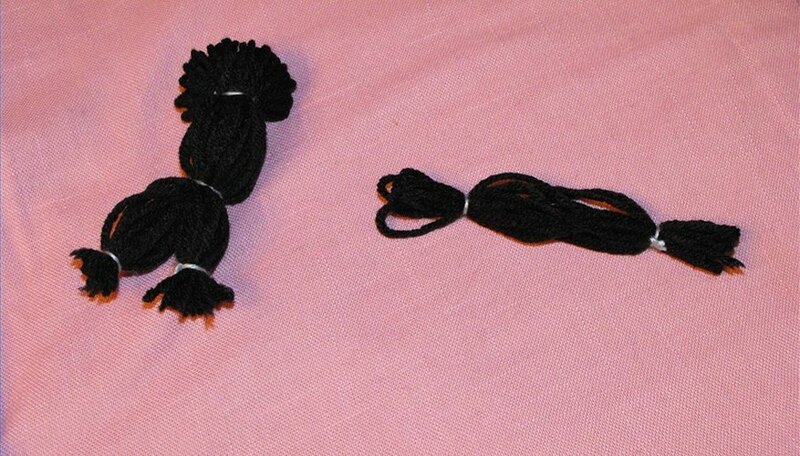 Tie the middle of the string bundle with a piece of string from the contrasting colored yarn ball. 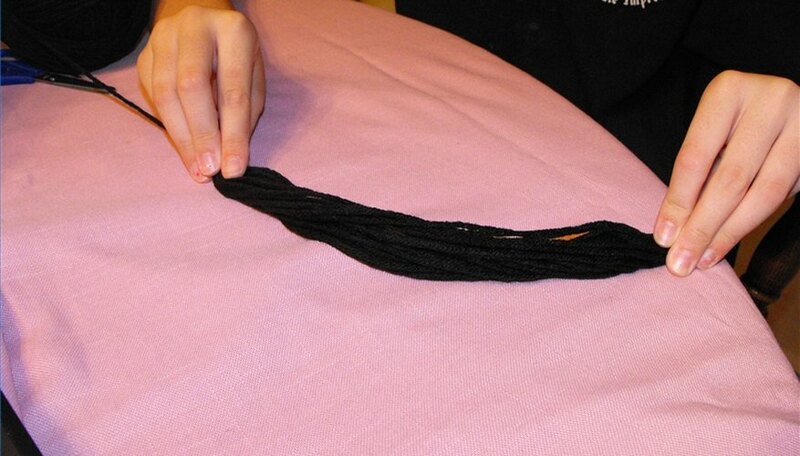 Pick up the bundle of string by the tied section, folding the bundle in half. Snip the ends off of the string tying the bundle. Measure 2 inches from the tied knot top. Tie the bundle with the contrasting string. Snip the end pieces. 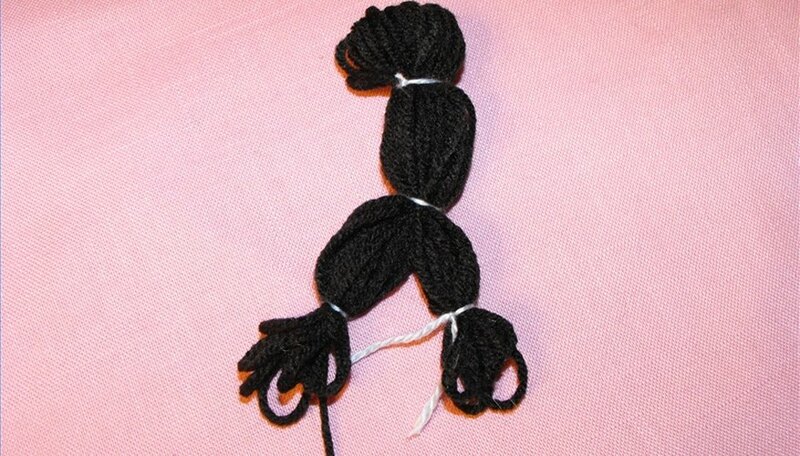 This creates the doll's neck, giving its head shape. 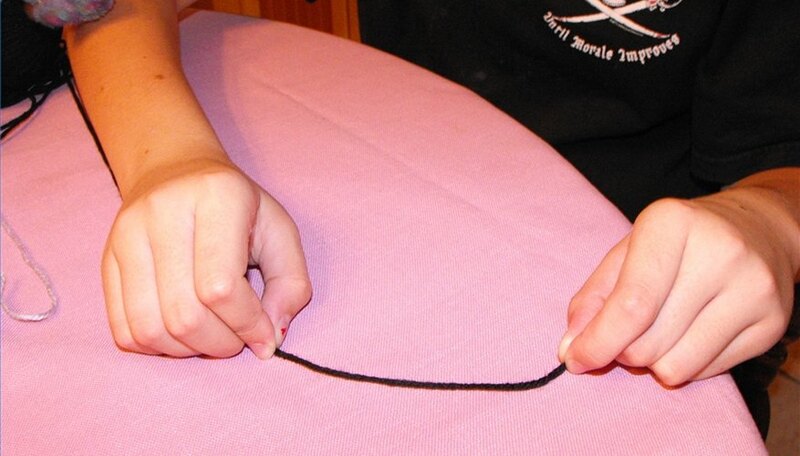 Measure 3 inches from the neck and tie with a second piece of string. Snip the end pieces. 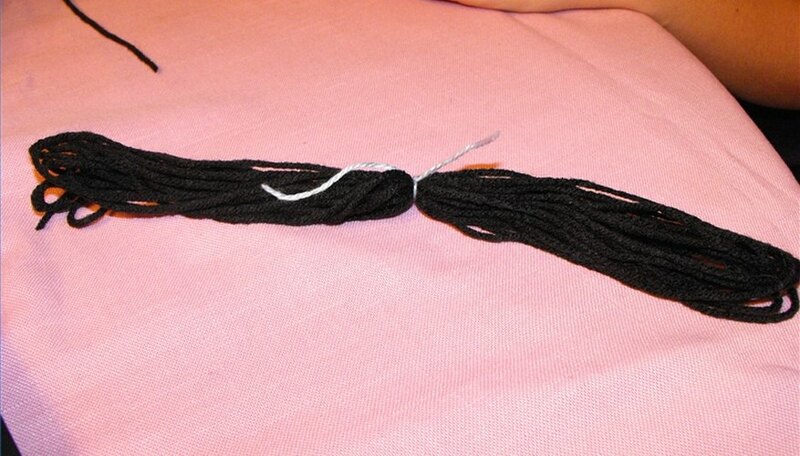 Divide the remaining string in half and tie near the bottom. This creates the doll's feet. Cut the extra string and cut the ends of the feet so the loops are gone. Hold the end of the string with your left hand. Pinch the string in your right hand 6 inches from the end. Take the string in your right hand and put it in your left hand. Continue pinching the string, moving it from the right hand to the left hand 40 times. 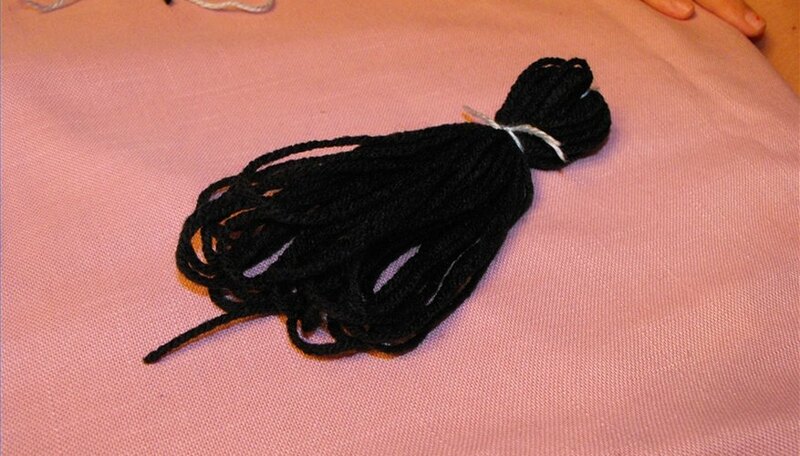 Measure 1/2 inch from the end of the bundle and tie with the contrasting colored string. Repeat on the other end of the bundle. This bundle becomes the doll's arms. Push the arms through the doll's body unit it is the same length on both sides. Snip the loops. 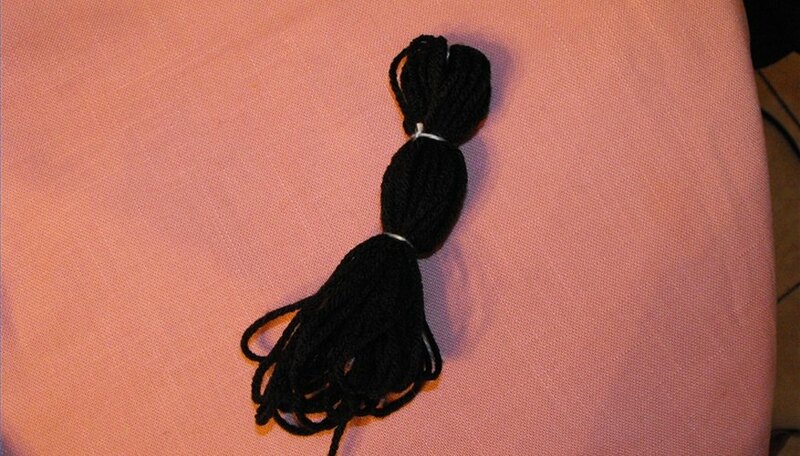 Tie a knot in the upper left head area where an eye would be using the contrasting string. Snip any ends. Tie a second knot in the upper right area where the other eye would be. Snip off any ends. 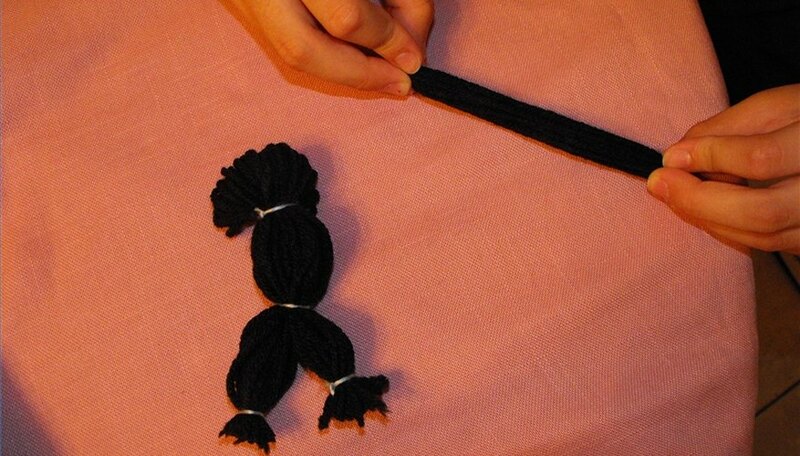 Tie a third knot in the middle of the face for the nose and snip off ends. Tie a knot horizontal to the nose on the left side of the face bring the string directly under the nose and tie a second knot. Cut any ends. Repeat on the right side of the face, creating a smile. Adapt directions to make different sized dolls. Experiment with different color combinations. 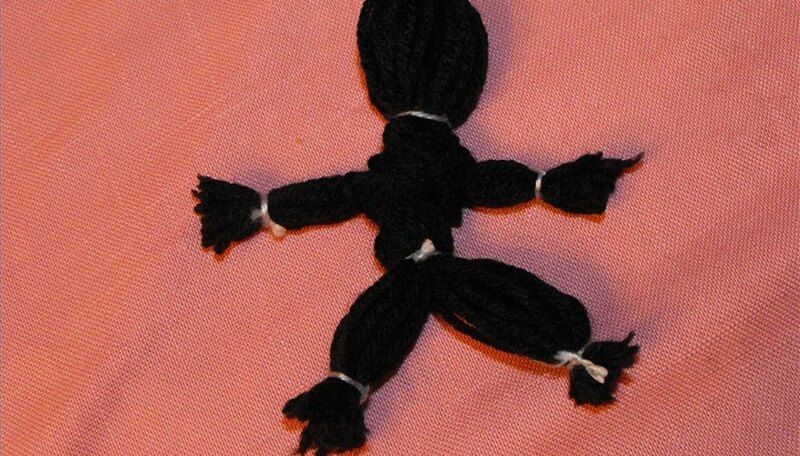 Experiment with creating hair by tying strands of string to the head. Use caution when with scissors. Jamie Hobbs graduated from Central Washington University with a BAed. She has been writing for Demand Studios and Suite 101 since 2008. Mrs. Hobbs work has also been printed in Yakima Family Times.